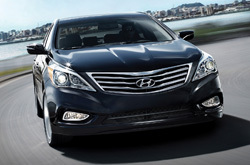 We encourage you to scroll past the YouTube video located below to read a full review of the 2013 Hyundai Azera. All Hyundai franchises in Dallas aren't the same. At Van Hyundai, we feel it's our job to furnish customers with quality Hyundai reviews that set us apart from the typical franchise. We're your Hyundai Azera dealer; this article will help you learn everything you need to know about the Hyundai Azera in Dallas. Is the Hyundai Azera right for you? Read on and find out! When comparing the 2013 Hyundai Azera side-by-side with the 2013 Chrysler 300, Ford Taurus, Buick Lacrosse and the Toyota Avalon, and you'll see that the Azera outperforms those autos in many aspects. Browse just a few of the reasons below. Get a no-charge warranty on repairs - plus access to actual Hyundai parts and wonderful Hyundai technicians - at your dominant Dallas area Hyundai repair center. Your Azera will run problem free with a hand from the masters at our Dallas service center. We handle a gamut of jobs, including everything from speedy oil and filter changes and battery replacement to complicated projects like transmission maintenance and more. For both complicated and incomplex services, our Dallas car repair center does everything; plus Van Hyundai offers low-cost maintenance pricing. Get started on your next appointment by selecting a money-saving service coupon.